Eggplant or Brinjal as it’s otherwise known, is notorious for absorbing a lot of oil. 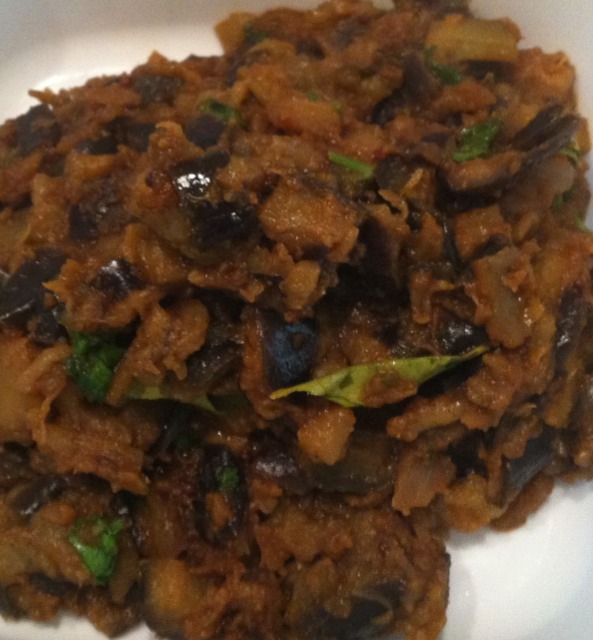 One way to prepare eggplant without using up half a litre of cooking oil is to prepare Baingan Bharta. Baingan Bharta is traditionally made by burning the outside of the eggplant, leaving to cool for a bit and then scrapping the burnt skin off, and chopping into small pieces. A tadka is added to finish it off. It tastes wonderful with rice or roti, but can require a bit of planning and effort. Unfortunately I’m simply too lazy for that kind of complicated cooking on a Wednesday night. Cranking up the Weber BBQ is Mangy’s job, and the mess burnt eggplant leaves in an oven, isn’t worth the effort. Last night I really wanted Baingan Bharta, so I worked out a cheat’s way of getting that luscious, soft, silky mouth-feel without all that effort. Mangy will argue that it’s not the real thing. That’s true, but if you have a mid-week craving for mushy eggplant, I can assure you, this recipe will just hit the spot. Heat 2 tablespoons of oil, add the cut eggplant and fry until you get some golden colour. The eggplant will not cook through, you just want to add some colour. Crank up the heat, pour in ½ cup water and put the lid of the pan on. You’re trying to create enough heat to steam the eggplant. Leave it for about 5 to 7 minutes. Remove the lid and check eggplant. Should be 3/4-cooked by now. Add onion paste, stir well. Add another ½ cup of water, put the lid on and cook for a further 3 minutes. Remove lid, and stir well. Push the mixture to the side, add 1 tablespoon of oil, add hing, curry leaves, cumin seeds and mustard seeds, once they splutter, stir well into the eggplant-onion mix. Keep frying mixture until it turns to a dark brown colour. Add chili powder, turmeric and coriander powder. Salt to taste. Continue cooking for another 3 or 4 minutes. Add fresh coriander and serve.